Do you have to wait until the adults are away, before you climb up to the nest is a question often asked? In general, this works to our advantage as it means that the adults fly away from the nest and the chick does not struggle and hurt either itself or hopefully, us. On Saturday only KL was on the scene at the beginning but was soon joined by Unring who had been off to catch a fish. He was determined not to let go of this and circled around clasping it, until the excitement was over. Whereupon, he ate it himself! 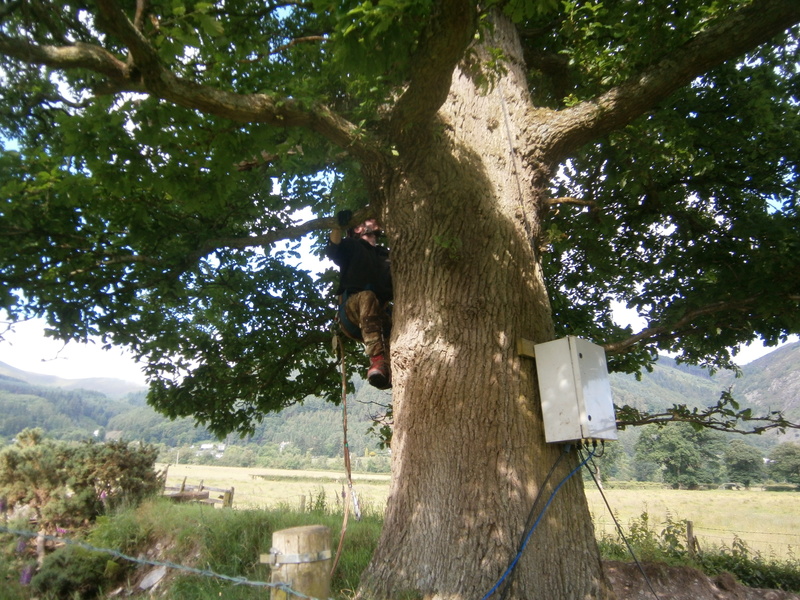 Meanwhile, the tree climber, under license, climbed up to the nest and popped the chick into a soft bag, which he lowered on a rope to the ringer at base of the tree. He then prepared for a long and rather uncomfortable wait, perched on a side branch, so that the adult birds do not land on the empty nest. 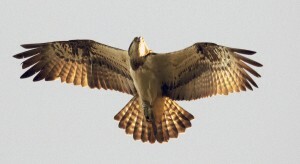 It seems that, using ‘bird psychology’, if the chick is back in the nest when we all depart from the scene at the end of the procedure, the adults believe that they have chased off the predator and see themselves as victors. Obviously ringing is a one off occurrence and there is little danger of the chick being abandoned by its parents as the bond is very strong at 5 weeks old. However, constant/ multiple human disturbances are a far greater threat and often will result in abandonment at the time or a nest move the next season. Whilst all this was happening the second tree climber went on a more hazardous climb into the next tree where the zoom camera is situated for operation lens clean. All this season there have been large blurry blobs on the zoom camera spreading over the picture, possibly caused by the calling cards of the resident spider, or a spontaneous growth of algae. The zoom camera is out on a limb so it took some heart-stopping contortions before at last a hand with a cloth poked out between the oak leaves and started the cleanup. Later we were very pleased to see that his efforts had been entirely successful and there is again a clear view at all distances on the screens at Whinlatter. At the end of the ringing procedure the chick was popped in the bag again and hauled up to the nest where the climber there gently placed her back in the centre to await her parents and a fishy brunch. Our thanks to the tree climber team for such a smooth and successful operation. 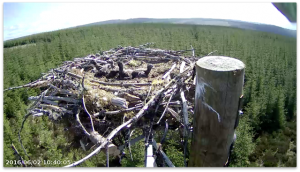 As you will have noticed from looking at the web stream, or visiting the screens at Whinlatter, our chick is now sporting a smart satellite tracker. Yesterday, under license, our ringer, with the transmitter expert, fitted our chick with two leg rings and the tracker. On her left leg there is a thin metal band with her unique number, and on her right leg is a blue colour ring with the white letter/number combination V5, both issued by British Trust for Ornithology. It was apparent as soon as she was removed from her carry bag that this was a fine and weighty individual. Feet and toes particularly caught our eyes as they seemed to be very large and well formed as she flexed her formidable talons. It looked already as if she was a female, but weight is the most telling evidence, and as the spring scale marker moved lower and lower the ringer did a double take, repeating the number twice. 1,810 grams. 1,810 grams!!!!! This was the heaviest bird we have ever had and put her firmly into the female category. Not only female, but feisty! In return for the indignity of being handled, she managed to put in a good few nips of her own. Summer flowers are a large part of the joy of being in the Lakes and these Red Campions, ruddy as a fine wine, are in full blossom at the moment. 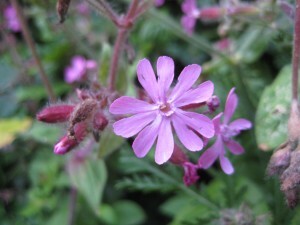 Each flower consists of 5 forked petals and, if you look closely, the flowers on individual plants are either male or female. This is a male bloom; females have a few sticky white threads protruding from the centre, to catch the pollen carried by passing insects. It is named ‘Silenus’, after the donkey riding woodland god of wine and usefully, the roots of these plants are said to contain small amounts of saponin, which can be lathered up as a natural soap, if caught out after midsummer revelry..
Four heads are better than one? Good news from Keilder, where we have a 4X4 situation in the rugged terrain. Four nests – and four chicks in one of them. 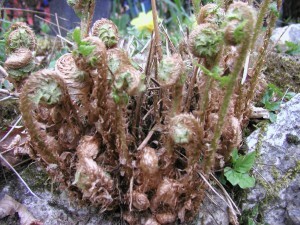 We are maybe a little jealous, but what a fine sight to see a forest of tiny heads bobbing up over the nest edge. Only about 1% of ospreys hatch four chicks – so we hope the (very hard-working) parents are successful in getting them to the point of migration! For a lot of the time we watch No 14 as a little red dot on a Google map, or in our bird’s case a hailstorm of red dots as he moves from place to place throughout each day. Sometimes it seems that he must have passed over the heads of the entire population of the Southern lakes at least once every 24 hours. He’s not always so easy to pin down in real time though as there is an inevitable lag on the satellite downloads, so it is always a thrill when a member of the Project actually can catch up with him and view him in solid flesh, rather than a flitting transmission ghost. 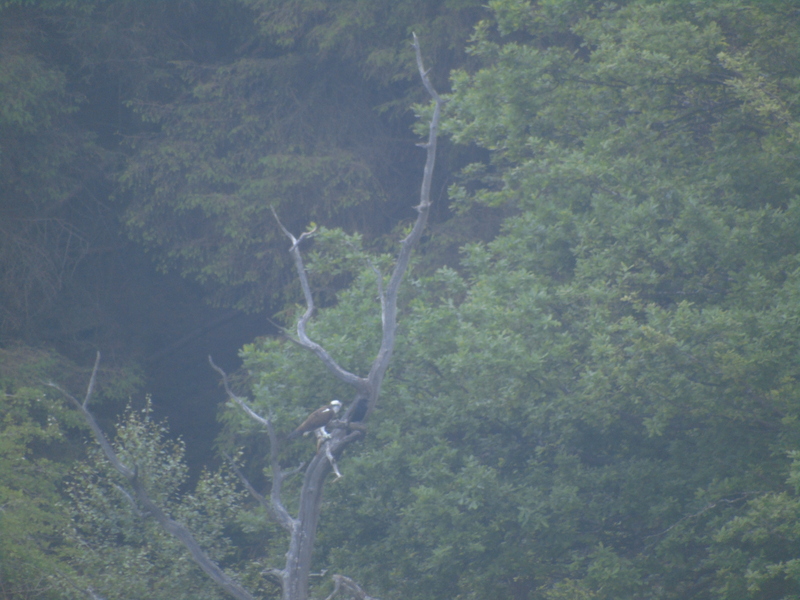 Here he is yesterday evening, photoed by Becky, nearly in her back garden, having a quiet interlude with a fish. No 14 a quiet moment between flights. Thank you Sal Lloyd for sending in this poem summing up some of the feelings that the picture of No 14 gives. What nature can really show……. I can refuse to eat my fish when I am full up. 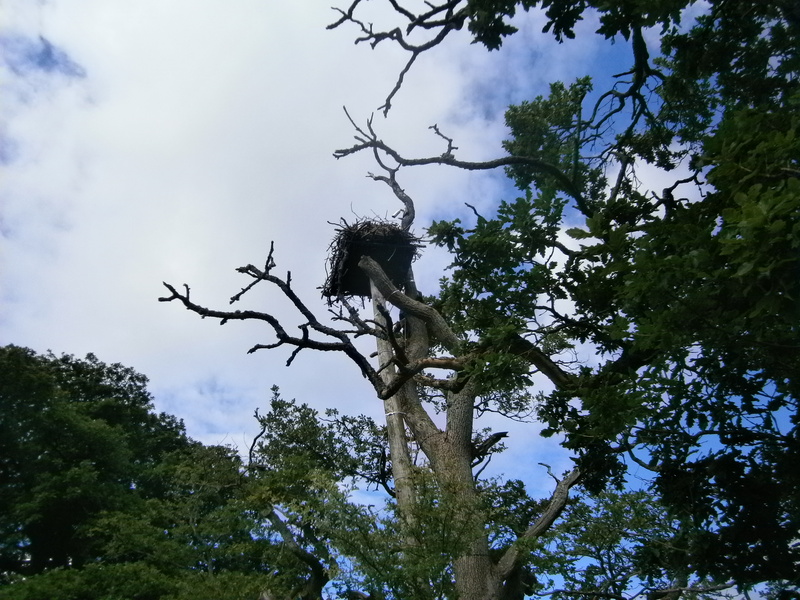 I can see over the side of the nest – what a big world out there! I can stand up for a short time on my legs. I can stretch my wings out. I can stretch my wings and stand up at the same time -oops! Nearly. I can preen my stubble. I can make a lot of noise whenever I feel hungry or ignored. I can poop right over the side of the nest. As you can see from the web-streaming, chick is now rapidly approaching its 2 week old anniversary and already it is pretty unrecognisable compared with its appearance a week ago. Then it was tiny white and fluffy with plenty of ahhh factor. Now it is obese, indeterminate grey, and spotted with feather buds with a lot more ugg factor – but presumably, in common with mothers everywhere, this mother can see no flaw in it. 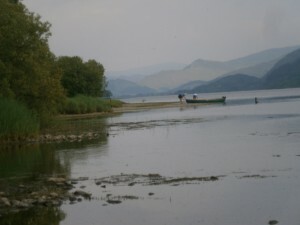 Unring has been fishing nearer to home and bringing back slightly smaller fish – brown trout and perch from Bassenthwaite and the river – rather than the enormous rainbow trout from over the fell. 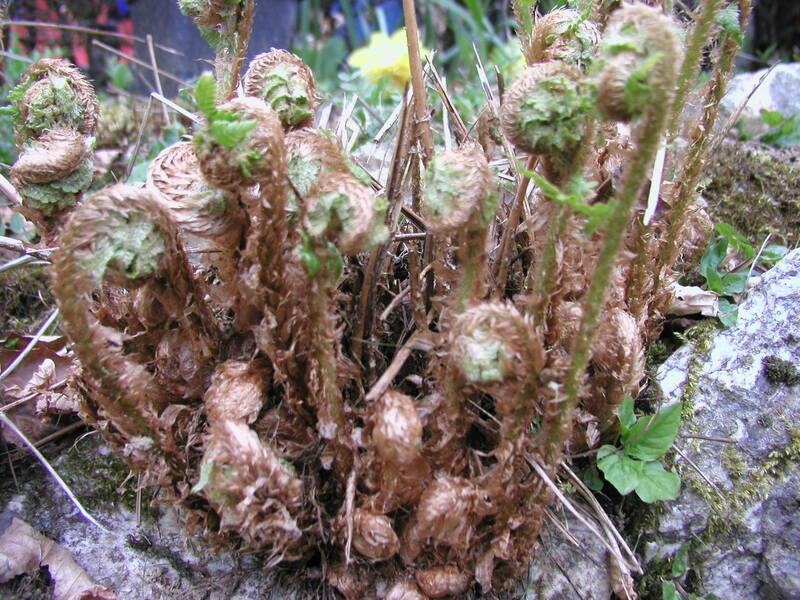 Fern Croziers, nearly as fluffy as chicks themselves unfurling on all the fell-sides. This week there have been some good sightings of other ospreys in the area. On Saturday a pair (possibly our ‘honeymoon’ couple) floated over Thornthwaite, much to KL’s disgust. Off went Unring to see them away whilst KL threw herself dramatically down over her chick and the latest fish indiscriminately. Obviously not welcome, the pair flew down over the mouth of the Derwent under the Lower Viewpoint where they were mobbed by crows. So much for a quiet romance. Later, a lone third bird turned up. 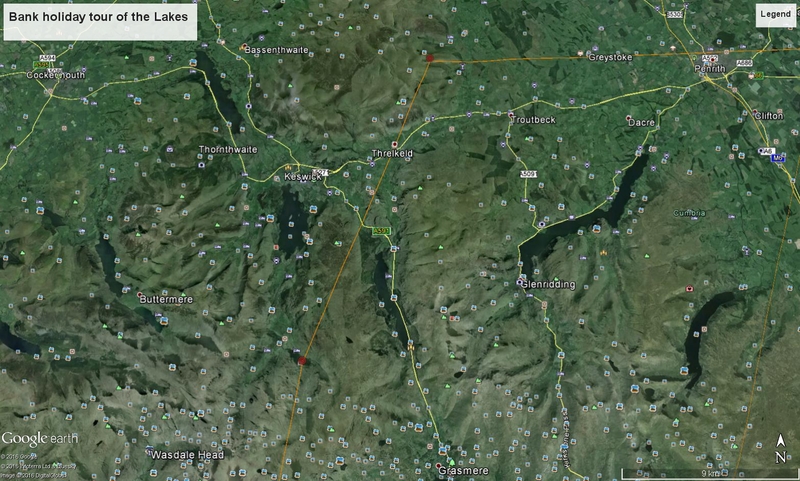 Was this Number 14 on yet another circumnavigation of the Lakes? We asked his tracking minder and he came up with a map for Monday bank holiday and the comment below.